We design bespoke lighting for our clients and light fittings can be made from a range of metals, including brazed copper, brass, black mild steel and light mild steel. 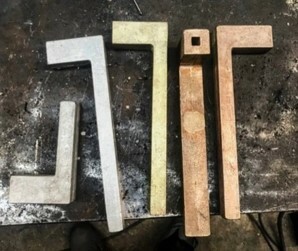 Currently, we are researching door handle design and manufacture (small scale – batches of ten or so) via casting metals in a foundry – liquid metal is poured into a mold that contains a hollow space of the required design, and is then left to cool and solidify – the solidified part is called a ‘casting’. In this short post, we explain the different types of metal casting and provide some brief information about foundries (factories that produce metal castings) in the UK. The first stage of metal casting is to make a mold into the desired shape. A mold can be open or closed: in an open mold, the molten metal is poured directly into the mold cavity and the material is exposed to the air, like a cup. Closed molds are more common: the molten material flows into the mold via a short entrance cavity and the mold is closed off from the air. Metal is melted in a furnace before being poured into the mold, normally by automatic pouring machines. After being left to solidify, the metal component is removed from the mold, degated (any excess material is removed) and cleaned. The product is then ‘finished’, which usually involves grinding, sanding or machining to ensure the desired finish is achieved. Molds can be expendable or permanent: an expendable mold is made of sand, plaster, or similar, and can only be used to produce one metal casting as the mold must be destroyed to remove the casting. A permanent mold can be used to make many castings as it is usually made of metal or a refractory ceramic, with sections that can open or close to allow the casting to be removed. There are several different types of expendable mold casting. Sand casting is the most common, as almost all casting metals can be produced using this method. Sand castings can be any size and used to make a wide range of products, with another advantage being that sand is inexpensive. Plaster mold casting is a similar process to sand casting, with plaster of Paris used instead of sand to make the mold. Other types of expendable mold casting include: ceramic mold casting (allows materials to be cast at much higher temperatures); shell mold casting (particularly suited to steel castings); vacuum casting (also known as the V process, which uses sand with no moisture with the internal cavity of the mold held in shape using a vacuum); expanded polystyrene casting (a sand mold is packed around a polystyrene pattern); and investment casting (a wax pattern is coated with refractory ceramic material). When working with permanent molds, ‘basic permanent mold casting’ is a term that describes all types of permanent molds. Sections of the mold are normally made from metal blocks that fit together, allowing them to be opened and closed easily and with accuracy. Although making the mold can be expensive, it may be used tens of thousands of times, making it suitable for products such as kitchenware. The majority of foundies in the UK are members of the Cast Metals Federation (CMF), the professional body representing and promoting the UK casting industry as a whole. The CMF website has a directory of foundries and suppliers. More information about our recently completed bespoke lighting designs (door handle designs to be completed en breve): El Montovano Pendant; El Kiazim Wall Light; Christie Pendant Light.